L3 Narda-MITEQ has delivered more than 200 Ka Tri-Band Block Upconverter units to customers worldwide in support of SATCOM and data transferring applications. These outdoor weather-sealed units provide state-of-the-art frequency conversion from L-band signals through Ka-band by upconverting, amplifying and transmitting mission-critical data to the satellite. 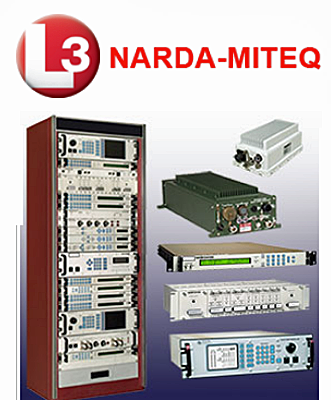 L3 Narda-MITEQ combines more than 60 years of innovation and expertise in microwave and RF technology. The company, which is headquartered in New York City, designs and manufactures standard and custom products, with stock delivery provided for an extensive selection of catalog components and also offers a broad range of SATCOM solutions, passive and active components, subsystems, pin diode switches, IMAs, spaceborne components and RF safety monitoring equipment. The company's products and services support defense, research, communications, and medical and scientific end markets. Mitch Haft, the Director of SATCOM Sales at L3 Narda-MITEQ, commented that the company takes great pride in providing a complete range of SATCOM solutions that deliver superior performance in phase noise, frequency stability and reliability. With a product portfolio that is composed of frequency up/downconverters, test translators, switchover systems, amplifier systems, equalizers, fiber-optic links, uplink power controllers and custom offerings, the firm is committed to satisfying customers’ needs, no matter how large or small.